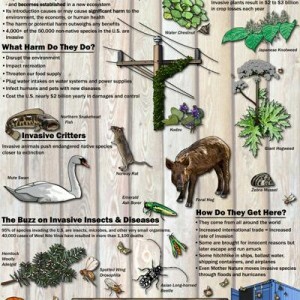 The NY invasive species poster is still available at no charge (for either the poster or for shipping). 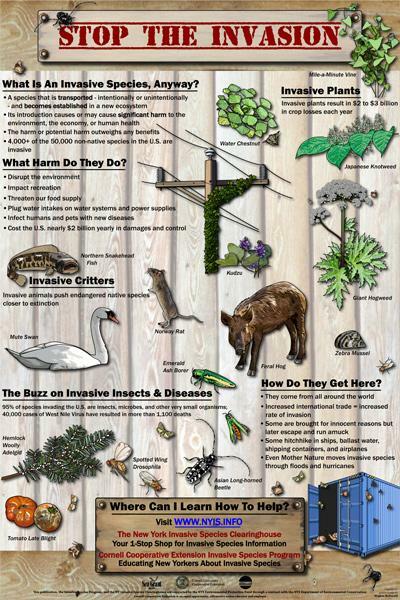 The 24 inch by 36 inch full color poster presents a general introduction to the topic of invasive species in New York as well as showing a number of species of interest in the state. The poster is available at no charge. Lots of ten or more will be shipped to agencies and organizations free of charge. Single or multiple copies less than ten to individuals are free but a shipping charge will be applied dependent upon the number of posters ordered. To order posters, please send an e-mail to: chuck.oneill@cornell.edu with the word POSTER in the subject line. Be certain to give the name (and brief description) of your organization, shipping address, number of posters needed, and to whom they should be addressed. A telephone number would be appreciated.